In ancient times, the Greeks and Romans believed that the gods sent and also also cured illnesses, which were created as a result of Zeus's wrath at Prometheus and were released when Pandora opened the box of evils. The first physician-healer was the god Apollo, followed by this son Asklepios who was deified at an early date (6th cent. B.C.). His cult and his sanctuaries-sanatoria called Asklepieia flourished from the end of the 5th cent. BC onwards. Hygeia the personification of health was also worshipped along with other local healer-heroes such as Amphiaraos. The earlies evidence for the application of medicine and surgery to the wounds of warriros is to be found in Homer. The doctor's of Homer's time relied on inheritedexperience and their healing skills. Hippokrates (460 - 370 B.C.) is regarded as the father of medicine. Though his philosophical speculation, rational practice o medicine and writings, he laid the foundations of scientific medicine (surgery, gynecology, midwifery, opthalmology, dentistry, diet and pharmacology). From the 3rd cent. B.C. onwards medicine experienced a fresh flowering in the great Hellenistic centres o Alexandria, Pergamon and Antioch, where doctors began to specialise and the dissection of human bodies was first carried out. From the 1st. c. AD onwards anaesthetics began to be used during operations. Medicine reached a high level with Galen from Pergamon (A.D. 129 - 216) and after his it ceased to develop. In Roman times medicine was also practised by women. Many medical schools were founded from the time of Hippokrates to that of Galen, including those of Kos, Knidos, Rhodes, etc. Medicine, surgery and pharmaceutics were practised in surgeries located in open areas (stoas) frequented by many people in the homes of the sick, and in the Asklepieia where priest-healers exercised a healing influence through suggestion and the patient's sleeping in the temple of the god. These were tools used by doctors during the examination, operation and treatment of patients. Most of them date in the Roman period, especially from the 1st to 4rd cent. A.D. Exceptions are formed by the forces for removing hairs Λ89 which dates from thre end of the 8th cent. B.C. 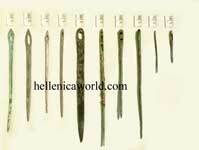 , the bleeding cups Λ349a to 500-450 B.C. and Λ381, Λ382 , Λ382 from the 2nd - 7th cent. A.D. Many instruments are adorned with the symbols of the god of medicine. Snakes are commonly found and there is also one example decorated with a mouse, which is associated with the sanctuary of Asklepios at Pergamon. The medical instruments on dispaly form part of the Collection of the doctor Konstantinos Lambros, which was confiscated in Berlin and brought to the National Archaeological Museum in 1899.